“Girls are like potato chips. Once you get started it is really, really hard to stop.” This may not be the best way to start out a father/son talk about boy-girl relationships; but for a shy dad and a not-always-communicative 14-year-old son, it did get the ball rolling. While the discussion topic was not always easy, the setting was unequaled. 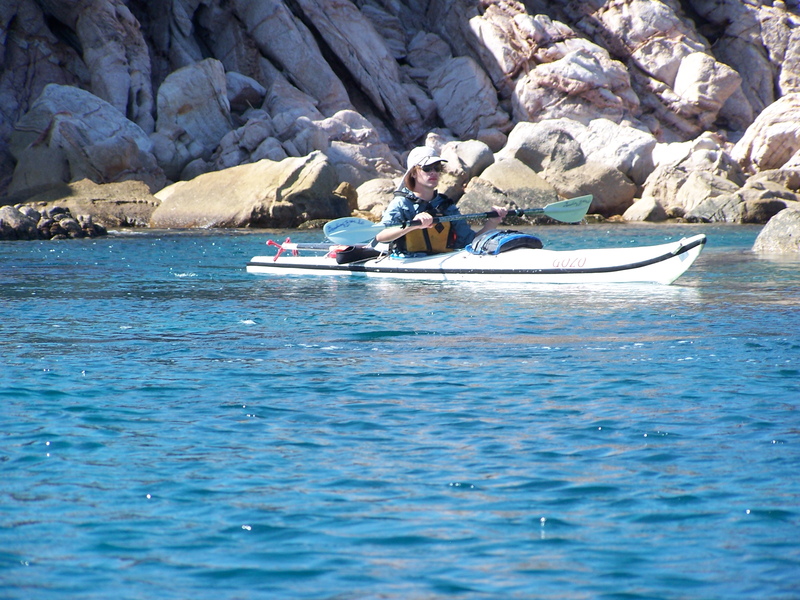 My son Joel and I were on a three-day circumnavigation by sea kayak of Espiritu Santo (Holy Spirit) island off the coast of Baja California Sur in the southern reaches of Mexico’s Sea of Cortez. The purpose of the trip? Adventure and a chance to get away from it all and talk about all the things that a dad should talk about with his son. 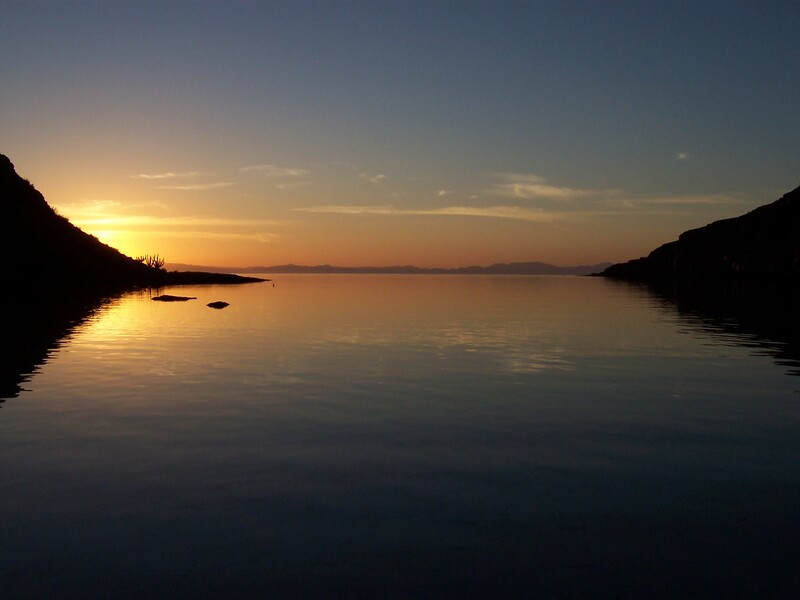 The island, sometimes called the Pearl of the Sea of Cortez, is a 12-mile-long, three-mile-wide desert island shaped much like a huge, thick-bodied comb. One side of the island is a series of deeply indented, cliff-lined bays, each of which terminates in a perfect white sand beach. The other side, the eastern side of the island, is like the back of a comb, relatively straight, with no coves, bays or other protected inlets. For a mariner, a windy day on the eastern side ranges from challenging to downright dangerous as it becomes a lee shore with pounding waves relentlessly beating on mile after mile of unyielding rocks, cliffs and reefs. Woe to the sailor who finds himself in distress on that shore. Our first day out was like a photo postcard. 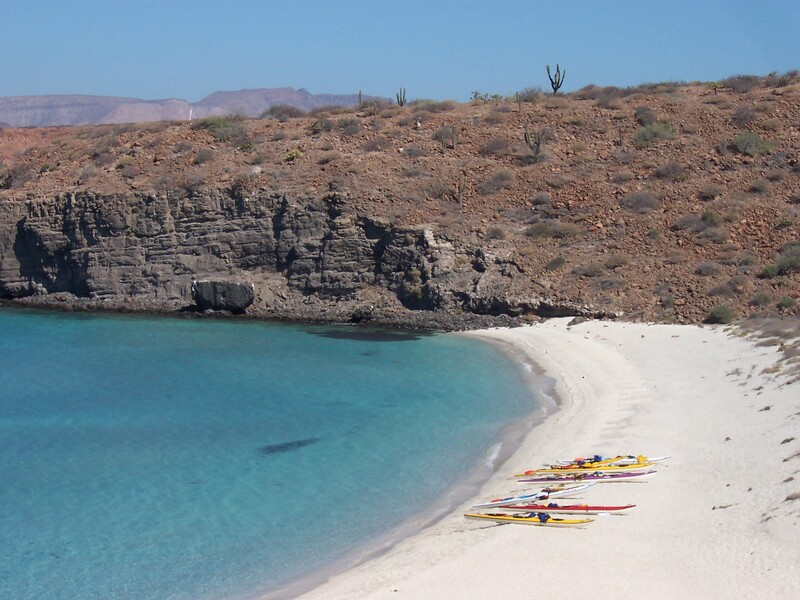 A gentle breeze cooled us as we paddled the 4.5 miles from the Baja mainland out to the southern tip of Espiritu Santo. The transparent blue water parted gently as our two fiberglass sea touring kayaks created V-shaped mini-wakes in the silky smooth water. The upturned bows of the kayaks nosed into the barely perceptible head wind. The occasional flying fish or diving sea bird let us know that we were not the last life forms on earth. Every so often a sports fishing boat would race past us on the near horizon in pursuit of dorado, marlin or tuna – but then silence again. The solitude and silence discovered while in human-powered craft far from shore is a delight that needs to be experienced at least once in a lifetime. 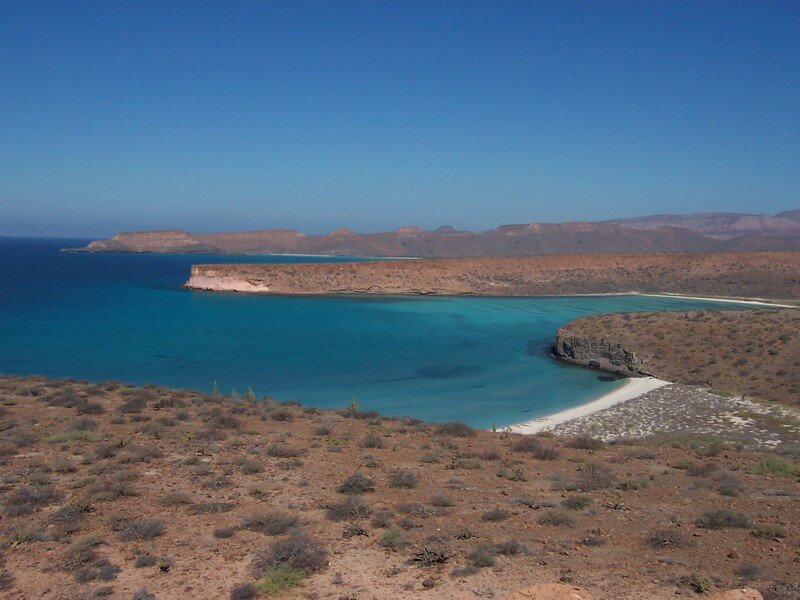 Playa Despensa near the southern tip of Espiritu Santo Island. Our crossing lasted a little under two hours. It was Joel’s first crossing of a deepwater channel and the farthest he had ever paddled off shore. In typical adolescent fashion, any emotional display for a job well done was masked with a feigned “Ho Hum.” We ducked into Playa Despensa, a horseshoe-shaped bay that is often used as the staging area for kayaking groups embarking on multi-day adventures. For us it was a time to open up the can of Pringles stuck in the bungee chords of Joel’s waterproof deck bag, get a drink, and stretch our legs. It was also a time to gaze at the water, a multi-hued blue and green masterpiece highlighted by a white sand beach and a stratified red and pink layer-cake cliff opposite our landing site. After a brief stop, we climbed back into the boats to begin the next leg, three hours of exploring coves, small islands and white sand beaches. Our next stop was Isla Gallina, or Chicken Island. Isla Gallina is a tiny red rock island with sheer cliffs running nearly all around it, denying even the remotest hope of a beach. At its base, on the southern side of the 200-yard-long island, there is a small rock shelf about a foot above the water line at high tide. We put our boats up on the shelf, dug out our snorkeling gear, and jumped into the clear blue water. The island is a starfish paradise. Blue, purple, and red starfish were everywhere. Other starfish, including the chocolate chip star, (yes, it looks like it is covered with chocolate chips) were also abundant. Trumpet fish, trigger fish, parrot fish, sergeant majors and Cortez Angels filled the water like a two-page spread in National Geographic. A variety of brown, stringy, twisted corals blanketed many of the white rocks, transforming them into the envy of any dredlocked Rastafarian. Chilled, we exited the water. Joel climbed up a short cliff to the top of the island. He discovered the island to be one of those guano-frosted islands often seen on Animal Planet. It was a madhouse of angry birds threatening to run us off their island and away from their eggs, which were lying around the ground in hastily assembled nests of twigs and dried seaweed. The haphazard, unplanned nature of the nests evinced little pride in homemaking. As the angry birds shrieked and flapped overhead, I couldn’t help but think of some of the horror movies of yesteryear such as Alfred Hitchcock’s “The Birds.” I was glad to be wearing sunglasses, just in case. Late in the afternoon we slowly paddled into Playa Mesteño, one of those long, narrow indentations that cuts deep into the island. The water in the bay was flat calm, the sand white and perfect, the beach deserted, clean and unspoiled. Our most visible companion was a large blue heron who stood on the shore waiting for…. whatever herons wait for on the beach. We set up camp, which consisted of breaking out the stove and throwing our sleeping bags onto the sand. The temperature was ideal and there were no bugs; a tent would have been superfluous and a waste of energy to set up. I don’t believe in retributive karma, nor do I believe that good and evil are doled out in precise, predestined allotments to each person. However, the trip which up to now had been perfect took a turn for the worse, almost making me doubt my unbelief. Our first cooked camp meal became a cook’s nightmare. Though difficult to believe, I did the impossible: I ruined a meal of “Hamburger Helper,” although it wasn’t exactly my fault. Just after browning the ground beef, the stove started to act up and the heat it produced dwindled till it was barely enough to warm the water, much less boil the noodles to softness. The water refused to boil, the ground beef began to turn into a liverwurst-like pate, and the noodles remained al dente al maximus. “Good job, Dad,” was the less-than-sincere praise heaped upon my culinary efforts. It did keep us alive. The stove issue was one that had to be resolved, since Espiritu Santo has a strictly enforced no open fire rule owing to its status as a United Nations World Heritage area. I suspected that the white gasoline, purchased in a local hardware store, might be the culprit. The troubleshooters’ guide that came with the tiny camp stove seemed to corroborate my suspicions. I dismantled the stove and replaced the white gasoline jet with the one for kerosene, assuming that the finer orifice used by the white gasoline was clogged with gunk. That more than did the trick. The stove became a raging blowtorch, a welder’s fantasy, a micro Hell. The stove became all or nothing. For the rest of our three-day camping/kayaking trip, every cooked meal was like an Oreo cookie: the outside hard, black and burned, with the inside raw and gooey. The fact that I am now writing this 24 hours after completing the trip indicates that my cooking, while a failure on nearly all counts, was not immediately fatal. During the first night on the island, the wind picked up. The problem with wind on this island is that it makes the eastern side of the island a boiling cauldron of tumbled and confused water. After a burned but raw breakfast we began paddling, unsure of whether or not we could continue with our circumnavigation or if we would be strong-armed by a power bigger than us and forced to retrace the previous day’s journey in the shelter of the island. 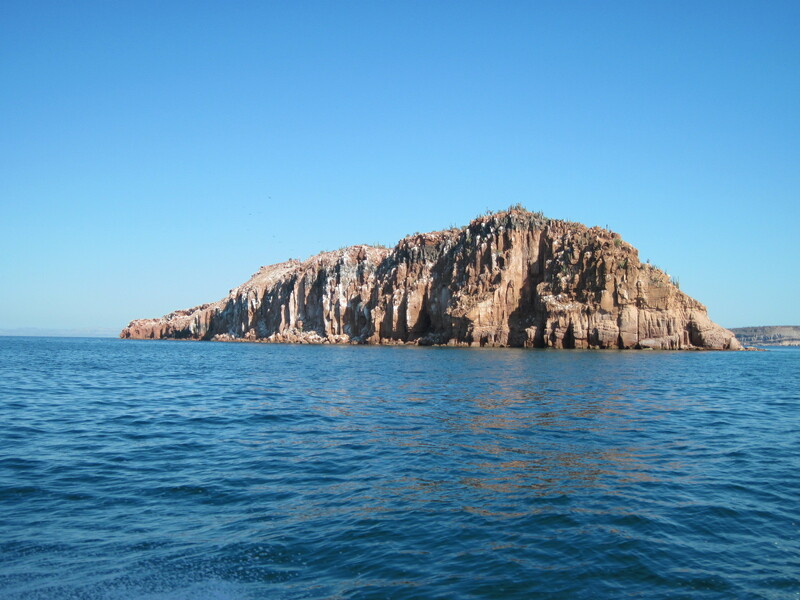 We rounded the northern tip of the island and headed out into the exposed Sea of Cortez. The wind was strong, the waves high, around six feet, but there were no whitecaps. I assumed that the absence of whitecaps indicated that the waves were residual waves, having blown in from the north during the night–and that as the day progressed and warmed they would slowly die away. Wrong. All day long the waves followed us, causing the kayaks to pitch and yaw. Like an unruly herd of sheep, whitecaps, called borreguitos (“little lambs”), began to appear and frolic around us. Sometimes the following seas would push us to the right, sometimes to the left. At times when a boat was on the crest of a wave, a gust of wind would spin the boat around nearly perpendicular to the wind. We were condemned to five hours of relentless, grueling, intense paddling. The wind never got any stronger, nor did it let up. It remained strong enough to keep the waves big and steep. The earlier lack of whitecaps had deceived me into thinking that the rough conditions were about to end. I nervously watched Joel. This was his first ever big water paddling experience. I don’t think I have ever been prouder of him. He handled his boat well, stroking, counter stroking, high bracing, low bracing and braking against the waves for hours on end. Not once did he complain. His face showed quiet determination and resolve. No fear. We had two options: turn around and battle headwinds and advancing waves and then retreat back down the western side of the island, or keep going. A third option would have been to give up and let ourselves be dashed to bits against rocky cliffs; but since this trip was billed as a father/son outing to build our relationship and talk about things that dads are supposed to talk to their sons about, being dashed against the rocks didn’t seem an appropriate finale to the trip. Every so often on the eastern side of the island, rocky headlands protrude. At each rocky headland, none of which was large enough to offer protection from the wind and waves, the seas grew even more confused. Some waves would refract around the headland, coming at us from other directions. Other waves would reflect off the cliffs, hitting us from the opposite direction of the prevailing waves. Other waves would strike submerged rocky reefs and seem to leap up out of nowhere. Still other waves formed klapotis or jump waves caused by the face-to-face collision of two waves traveling in opposite directions. Waves could and did come at us from all points of the compass. It was five hours of intense concentration without a pause for rest. After a long, hard, and relentless paddle, we rounded the last rocky headland and entered the shelter of Playa Bonanza, a two-mile-long stretch of picture-perfect beach. Protected by a large headland at the northern end, the water inside the bay was calm, with only gentle wavelets lapping at the shore. Rest, peace, food: a great way to end a long struggle. The tension of the previous five hours melted into oblivion, leaving nothing but a wild memory, a healthy boost of self confidence for Joel, and a feeling of accomplishment for both of us. We made camp, once again by simply throwing our sleeping bags onto the sand. Dinner was boxed macaroni and cheese. My blow torch stove, my Hell in a handbag, did a remarkable job of boiling the water for the noodles. After darkness had fallen, Joel and I lay on our sleeping bags gazing up at a moonless but incredibly star-crowded night sky. Only those who have been far from civilization in a desert or out at sea can truly appreciate the majestic beauty of the horizon to horizon clutter of uncountable stars. There were so many stars it got me wondering if God is not some kind of hoarder. Staring upward, we talked about a lot of things. We talked about what it means to be a good man, based on the New Testament book of Titus, written by the Apostle Paul. Words of wisdom 2,000 years old still packing a punch of truth, giving guidance for today, which if followed will help in marriage, work, relationships, enabling the simple joy of good living. My hope and prayer for Joel is that these words will guide his life, as in just a few short years he will be entering his own manhood. The words of the Apostle Paul and my example: will they be enough? Gazing up at the sky, I told Joel that I would not go to sleep until I had seen a shooting star and a satellite making its way across the night sky. Within two minutes I was free to go to sleep and within three, I was. 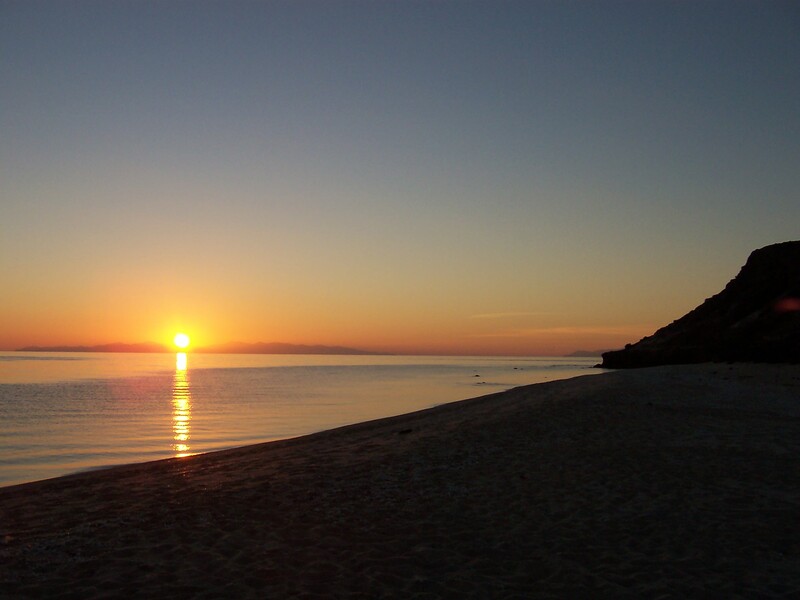 Dawn came with a beautiful sunrise over the Sea of Cortez. I enjoyed a pot of fresh coffee, brewed on Brimstone Bonnie, the stove from Hell. My 14-year-old son lay a few feet away still tucked inside his sleeping bag, his long uncombed hair a tangled, windblown, sea-salt-snarled mess above a still innocent face. Watching him sleep, I could see remnants of a young child, a little boy, not yet needing to shave or behave like an adult, but no longer addicted to Legos or Pokemon. Wasn’t it just yesterday that we took him out of the hospital wrapped in a tiny blue bunny suit with ears? Fifteen hours earlier, battling the wind and waves, I had seen in his face the early evidence of manhood: determination, vision, survival, goals. Boy or man? He is in that intermediate stage right now, no longer a little boy, not yet a man. It is my job as his dad to help him make that transition successfully. God help me. After an Oreo cookie-style breakfast of scrambled eggs and a quick loading of the kayaks, we were on our way back home. A calm, four-hour paddle across the Canal San Lorenzo lay before us, with a gentle breeze to cool our way and only tiny waves. In only five hours we would be home in La Paz, and we would have a shower and a meal cooked slowly and properly on a stove, not blowtorched into charcoal by the rebellious camp stove from the underworld. And there would be a strengthened friendship between a dad and his son after an adventure well done. Previous SHOULD I KEEP THIS OLD SHIRT?